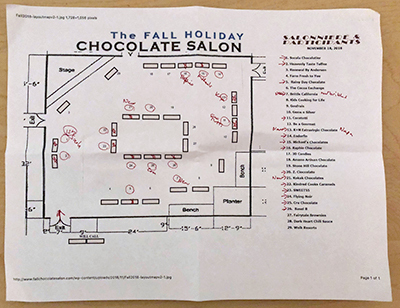 The 2018 Fall Holiday Chocolate Salon sponsored by TasteTV (held in November at the San Francisco County Fair Building/Hall of Flowers in Golden Gate Park) was sold out days before it happened, so we knew going in that it was going to be crazier than previous salons. 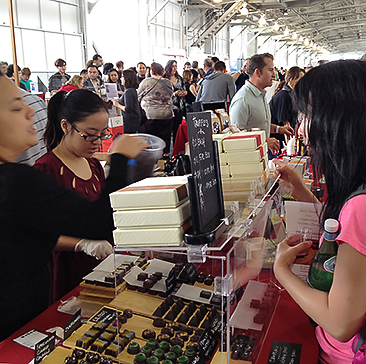 When you get a bunch of people jockeying for chocolate samples, it can get a bit frenzied at the more popular booths. When the crowd is at capacity, it’s nuts. In addition to the nutty atmosphere, it’s seemed like nuts was the theme. Not unusual for a chocolate salon, but while the trend other years has been booze or vegan, passionfruit or coconut, this time it was nuts. Almonds, hazelnuts, pistachios, or if not actual nuts, then nutty overtones or aftertastes to the chocolate, and nut substitutes like cacao nibs to add crunch but appeal to people with nut allergies or aversions. When you come to these salons, it’s good to have some sort of plan because #1 there is a limit to how much chocolate one person can sample and #2 there are always too many potential samples. So you could hit your personal limit before you get to taste something you were looking forward to or something you didn’t know would be your new personal fav, if you are not careful. My strategy is to focus on SFBA chocolatiers and candy makers, but sometimes even that is too much (15 locals this time). So I also aim not to sample anything I’ve tasted previously. I check out the floor plan before the salon and map out a path that moves from local vendor to local vendor with minimal backtracking. When the salon gets crowded, it might take longer to get to the next vendor, but at least I don’t waste time waiting at a booth I am not really interested in — or swimming upstream against the crowds to visit a booth I skipped. In addition, salons are good opportunities to buy chocolate you love. Vendors often have special deals at salons. But popular items can sell out — and quickly — so I prioritize who I want to visit based on what I might want to buy. All of my salon strategizing led me to make a beeline for Socola Chocolatiers when I got to the Salon. They were fairly close to the door, SF-based, and usually have something new for the salon. Plus I wanted to buy their Crunchy Matcha Green Tea White Chocolate Bar, which is very popular. It’s white chocolate (! 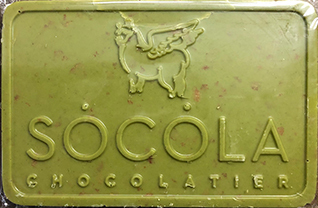 I don’t normally like white chocolate) that is naturally green colored due to a solid dose of matcha green tea. In addition there are crunchy cookie bits (feuilletine) sprinkled throughout the large bar. Unlike a lot of white chocolate, it’s not too sweet, the chocolate mostly serves to tone down the matcha bite, so it tastes like a good matcha green tea latte — except in solid form with an unexpected crunch. It was a good thing I acted fast — when another CBTB-er visited an hour later, she bought the last one. And that was at 11am of an event that went on until 5. At the Salon, Socola was featuring their “On a Faux Bear Rug” Holiday Collection, which features 4 flavored chocolates, including 2 nut versions: Hazelnut Praline, a smooth hazelnut flavored dark chocolate ganache full of small crunchy feuilletine bits with a long hazelnut aftertaste; and Pecan Toffee, a dark chocolate ganache with bits of roasted pecans and toffee that was a little buttery and a little sweet. The other 2 pieces switch from this year’s nutty theme to a previous year’s boozy trend: a salted pumpkin pie spice and brandy caramel, that had a texture more like a dense ganache than a chewy caramel, and a salt top note over a good pumpkin pie spice flavor; and a dark chocolate champagne truffle, which was a little sweet, but had a good chocolate flavor with a pronounced champagne taste. There were plenty of other options packing Socola’s booth, such as other big splashy bars with cereal, snacks, or freeze-dried fruits liberally sprinkled over them. Plus other truffle collections, salted caramels, pavés, pâte de fruits, and fun molded chocolates like their new Sprinkle Toes — a foot-shaped dark chocolate pop covered in multi-color sprinkles. What is a pillow top? Wendy explained that they are the chocolates put on upscale hotel bed pillows nightly. So in addition to finding Socola chocolates at their café, online or at events like the Salon, you might find them on your pillow the next time you travel. At the Salon, Socola received Gold for Best Traditional Chocolates and Best Caramels/Truffles; Silver for New Product Award; Bronze for Most Delicious Ingredients Combination; and Honorable Mention for Top Artisan Chocolatier and Best in Salon. 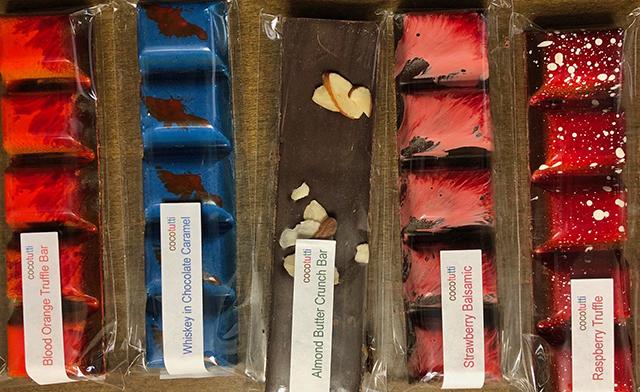 Socola’s chocolates and candies are available online, but for the full line including pastries, coffee and hot chocolate drinks, visit Socola Chocolatier + Barista on Folsom in SF. It’s also where you can pick up non-edible Socola items, like T-shirts and jewelry. We were happily surprised to see Matt Elkins’s Heavenly Taste Toffee at the Salon again. We haven’t seen him at the last couple of salons, and even the website went away. Matt told us he just took a hiatus and was back now. 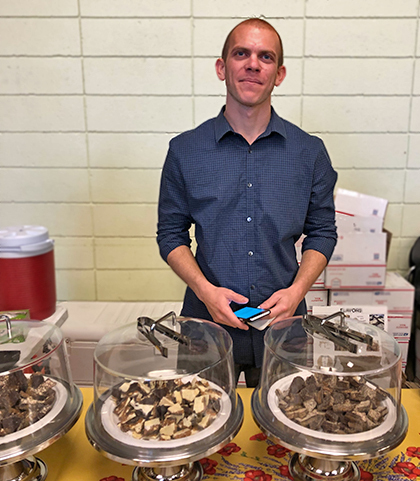 He had 3 flavors of his toffee based on his grandmother’s recipe: a classic dark chocolate almond, his black & white cashew toffee (which is a salted cashew toffee coated with dark chocolate on one side and white chocolate on the other), and espresso biscotti toffee, which was new to us. Like all Heavenly Taste toffees, the espresso biscotti toffee was a not-too-hard toffee with chocolate coating both sides. It was a good thickness with what looked like a 50-50 ratio of chocolate to toffee. (Yea! More chocolate!) The espresso was a nice top note, like a little shot of coffee. It’s a very tasty toffee with an unusual licorice hint (from the biscotti crumbs on top). Mostly though it had a good dark chocolate taste, that became sweeter at end from the toffee. It was crunchy more than chewy — no worries about losing a filling. At the Salon, Heavenly Taste received Gold for Best Toffee and Silver for Best Comfort Food/Snack Product. Heavenly Taste Toffee is back and available online, plus they deliver locally. Jeri Vasquez of caramel maker Kindred Cooks has been very busy lately. 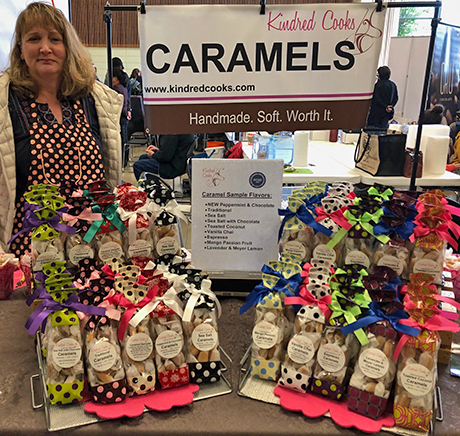 She put on a show in San Jose this year called the Kindred Craft Festival, where over a couple of days chocolatiers, candy makers, artisans, and craftspeople sold their wares. 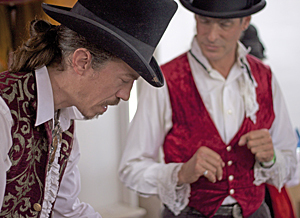 This extracurricular activity was a huge undertaking, with some local chocolatiers/candy makers (such as Salon vendors Basel B., CocoTutti, Michael’s, and Raphio) participating. “It was a lot of work,” Jeri told us. “I learned a lot from it. The hardest thing is to get the word out, and I have different ideas for next time. The theme will be candy with arts and crafts, and I want to incorporate candy into an art competition. As people whose blog’s purpose is to promote local artisan chocolate and candy makers, we like Jeri’s vision. We look forward to the next festival, and will help get the word out when we find out more details. It is a nice candy, incorporating Kindred Cooks’ chewy caramel and a good dollop of chocolate sprinkled with hits of peppermint candy. I liked it as much as her previous mash-up: Lavender and Meyer Lemon Caramel, which she said is still very popular. For the record, I am not a fan of strong floral flavors, but this piece is not overly lavender. The main tastes are lemon and caramel with the lavender in the background. Not to worry, Kindred Cooks seems well on its way to creating its own Willy Wonka world. At the Salon, Kindred Cooks received Silver for Best Caramels/Truffles and Bronze for New Product Award. Kindred Cooks Caramels are available online and in some SFBA locations like Draeger’s. They are often at special events like the Chocolate Salons. Check their Facebook page for upcoming events. 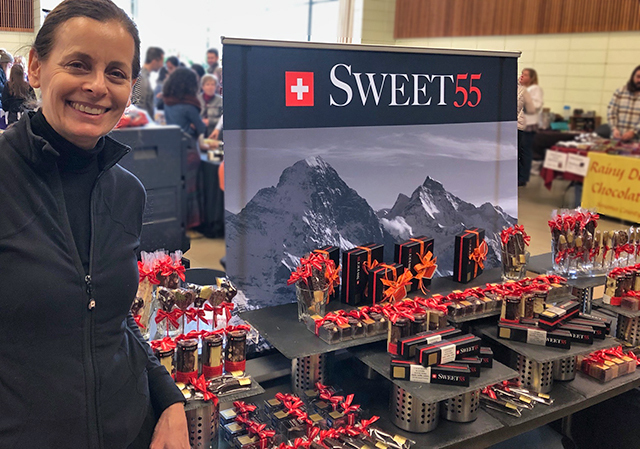 At Sweet55’s booth, we encountered hazelnut heaven — which is not unexpected since Ursula Schnyder, Sweet55’s founder and Chief Chocolate Officer, is a Swiss-trained chocolatier making Swiss-style chocolate in Half Moon Bay. To me, hazelnuts are the European equivalent of peanuts or almonds in chocolate. 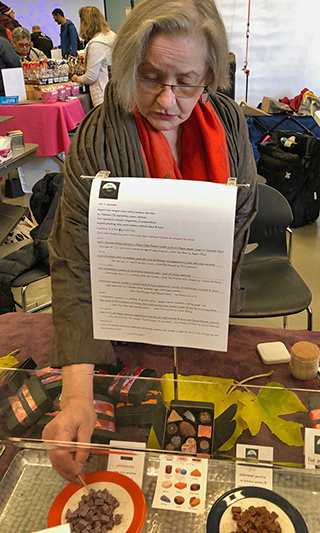 Of the 2 samples, Sweet55 was handing out at the Salon, one was Branchli, a traditional Swiss chocolate bar made with gianduja, which is a chocolate hazelnut paste. Like Nutella, but way better tasting. The crunchy sample was hazelnut forward, with the chocolate definitely playing second fiddle. The other sample, a simple 65% ganache was almost the opposite of the Branchli: a smooth, rich chocolatey piece. The contrast between the samples was nice and a good showing of Sweet55’s range of expertise. Ursula showed us 2 other bars at the Salon. One was a new bar that was a Good Food Awards finalist. The Triple is a 3-layer bar: hazelnut wafer cookie, salted caramel, and hazelnut gianduja covered in chocolate. It’s full of experiences: light but rich; crunchy & chewy & creamy — every texture you could want in a candy bar, all in one bar. Plus it has distinct hazelnut, caramel, and chocolate flavors. We thought it was a total winner, but we are not Good Food Award judges. The other bar Ursula had at the Salon did win a 2018 Good Food Award. The EMJ (short for Eiger, Mönch, Jungfrau, a distinctive mountain trio in the Swiss Alps) bar is shaped like its namesakes with white chocolate mimicking snowcaps on top. Not only is it a pretty bar, but it’s full of whole roasted hazelnuts in gianduja. It’s a great crunchy, nutty, chocolatey bar with the nuts also tasting caramelized, which the package described as a praline filling. We agree with the judges on this one: definitely a winner. 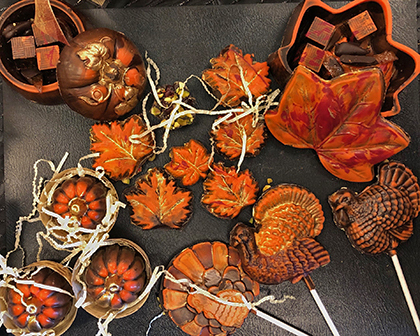 We also picked up the Sweet55 Thanksgiving box, which was their traditional mixed assortment of 16 pieces, specially decorated for the holiday. The boxes are a nice way to taste a range of their flavors, from single-origins to their California-inspired olive oil, but I think anything hazelnut by Sweet55 is what I would choose first. At the Salon, Sweet55 received Bronze for Best Traditional Chocolates, Best Caramels/Truffles, and New Product Award; and Honorable Mention for Top Artisan Chocolatier and Best in Salon. You can buy Sweet55 online, or take a weekend road trip to Half Moon Bay to visit the store for pastries and coffee — and the ability to choose your chocolates. Rainy Day Chocolate can usually be counted on to have something new at the Salons, and this time was no exception. 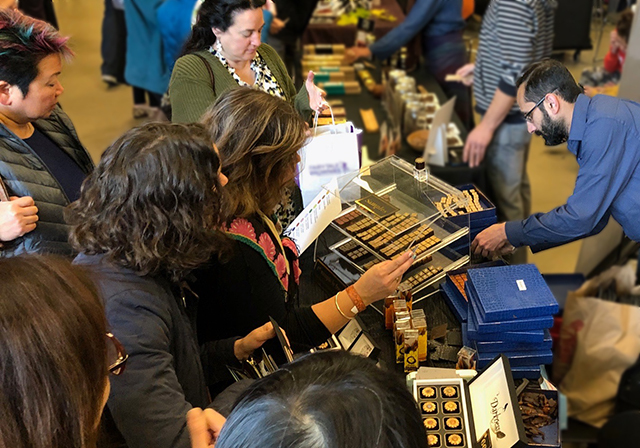 They had just won a bunch of awards at the 2018 Sonoma County Harvest Fair for their chocolates, including a gold medal for a new cherry truffle, which contained their signature chocolate blend flavored with morello cherries. They also had a new raspberry bar that was somewhat similar to a CocoTutti Quintet, but with more chocolate and less filling. The new Rainy Day offering I really enjoyed was their dual blends: 2 single-origin cacaos mixed in different percentages in 2 bars. Blends of beans from 2 or more origins are usually done to produce a consistent flavor profile from batch to batch. And single-origin bars are made to showcase the unique flavors of the location where the beans were harvested and can vary widely, like wine vintages. What Rainy Day is doing is mixing beans from Belize and Madagascar in 2 different ratios to make 2 different tasting bars from the same beans. They also blended the names: The “Beli-Gascar” is 80% Belize cacao and 20% Madagascar. The “Mada-Lize” is 80% Madagascar cacao and 20% Belize. Chris Sund, Rainy Day co-owner/co-chocolatier, explained that they wanted to showcase the differences in the beans, and it works. The Beli-Gascar was fruity first, then nutty and a little fermented; and the Mada-Lize was savory first, then fruity. If you’ve tried a lot of single-origin bars, this is a fun twist that highlights the difference in the beans but seems almost like a magic trick on your tongue. The dual-blend samples were almost paper-thin slabs. Normally I like thicker bars for the mouthfeel, but this was an excellent idea for tasting the contrasts between these bars because the thin wafers cover your tongue and melt quickly so you immediately start getting feedback from all the receptors in your tongue. It was easier to notice the contrasts than if I had to go through the usual routine of waiting for a thick piece of chocolate to warm enough to melt, maybe chew it a bit to get it started, and roll it around to taste the different notes. Normally that is sweet joy, but in the situation of wanting to compare and contrast these bars, slabs almost as thin as paper was a genius method of delivery. Rainy Day had a large selection of their regular items at the Salon too: Dark and milk chocolate covered marshmallows, Belgian chocolate truffles and bars, and their award-winning toffees. They make a great traditional-ish English Toffee with dark chocolate, almonds, and sea salt. And I really love their Milk Chocolate, Macadamia, and Toasted Coconut Toffee. It’s a good, chewy toffee, not too sweet, and very coconut-y. I confess that I had to shake out the very last bits of toasted coconut and macadamia nuts from the bag, because I wasn’t ready for it to be over. No surprise to me that it was a Gold Medal winner at the 2018 Sonoma Harvest Festival. At the Salon, Rainy Day received Gold for New Product Award; Silver for Best Toffee and Best Comfort Food/Snack Product; and Bronze for Best Chocolate Bar and Best Organic/Fair Trade Products. Rainy Day Chocolate is available online, at events, and in some markets and cafés in the North Bay. Check their website for locations. Checking in with Karen Urbanek at flying noir, she told us that she had made changes to her “out of country” and “poetry and prose” collections, her 2 latest collections. We liked both collections in their original form, but because Karen is such an experimental chocolatier, we were intrigued to see what improvements she made. The out of country collection focuses on political issues like immigration with pieces inspired by and named for different countries. Karen updated the collection by replacing Sweden and China pieces with pieces representing Haiti and Venezuela. The Haiti piece was a dark milk/bittersweet ganache with honey-cashew praline and habanero in a dark chocolate shell swirled with blue, green and gold mica. When we sampled it, I got a hit of the habenero immediately; the other taster got it last. The praline was a nice nutty crunch, and the slight heat lingered. The Venezuela piece was a 38% Venezuelan milk chocolate ganache flavored with a Venezuelan orange liqueur covered with the same dark chocolate and decorated with glittery little brush strokes of silver, blue and pink. It’s like a good orange milk chocolate with a little alcohol buzz that kicks up the dark chocolate in the shell. For poetry and prose, in which each piece is inspired by literature and includes a snippet of the relevant poetry/prose with the ingredient list, she had expanded from the original 6 pieces to 9. We tried the new “passionale,” which mixed bittersweet ganache, passion fruit, Japanese whiskey, and shichimi, a Japanese spice blend that includes sesame seeds, seaweed, ginger, and chili pepper. The whiskey was very subtle, and the shichimi added a nice savory bite to the tropical fruit flavor. Other highlights in the box include “diamond moon,” a crunchy-crumbly cylinder of bittersweet chocolate and caramelized bergamot zest; and “quatre,” a fall spice flavored ganache with a crunchy sugar-and-salt coated exterior. I liked the changes to both collections, and look forward to how they continue to evolve. Both collections are very pretty with hand-decorated pieces painted with natural colors and shimmery mica then packaged in flying noir’s signature butterfly closure black boxes circled by colorful strips of paper, either hand-painted or found images like a map. These would make good gifts for your more adventurous chocolate lovers who appreciate fine art. At the Salon, flying noir received Gold for New Product Award; Silver for Most Delicious Ingredients Combination, Best Caramels/Truffles, and Best Organic/Fair Trade Products; and Bronze for Top Artisan Chocolatier and Best in Salon. You can buy flying noir chocolates online and at special events. Check their website for details. 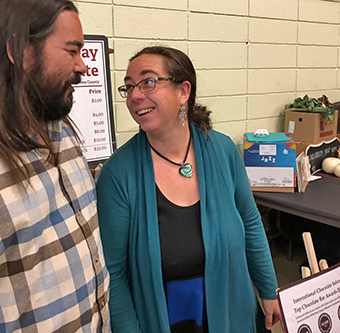 New to us at the Salon was Cru Chocolates, a bean-to-bar home-based business started by Karla McNeil-Rueda and Eddie Houston in 2016. They offer a range of single-origin bars and flavored cacao drinks — including some mixed with mushrooms(?!). Eddie gave us samples of some of the single-origin bars while talking about the business. He told us they work with 1,500 cacao farms to source their beans, which they roast, grind, and temper themselves in their home kitchen. When you hear “home kitchen,” you might have certain negative assumptions, but from the packaging to the bars themselves, everything Cru speaks quality. The 4 single-origin bars, plus the unique Flor de Maíz bar, have beautiful, distinct wrappers. Each bar has its own visual theme with the logo in gold foil on a black square in the middle of a lovely collage involving cacao pods. The packages are elegantly simple and secure but easy to open and close. Inside there is more explanatory text, and the bars are wrapped in gold foil. The first sample we tried was the 72% Haiti, which started really fruity and chocolatey, then moved to savory. The label mentions pineapple and honey notes and a floral flavor, but they eluded me. The 72% Dominican Republic was noticeably different (which I find interesting since they share an island): more nutty, less fruity. The 72% Nicaraguan was smooth with a fruity, raisiny taste that had a long chocolatey aftertaste. 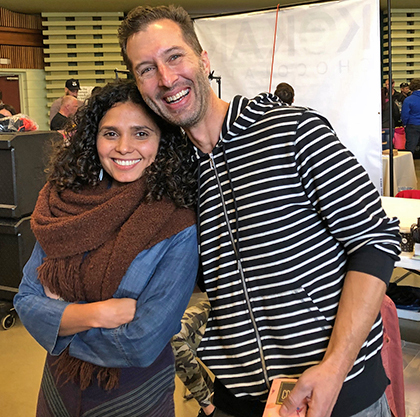 When we tried the 72% Honduras bar, which tasted very fruity with caramel undertones, Eddie told us that Karla grew up in Honduras, surrounded by cacao and making everything with cacao, except bars. 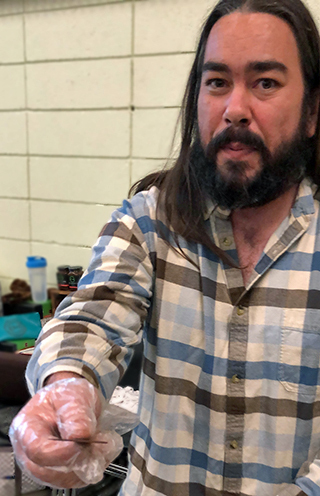 This led naturally to sampling the Flor de Maíz bar, which Eddie described as a traditional Mayan drink in a bar: cacao, toasted corn, cinnamon, and other spices. In Mayan culture, he said, corn is masculine, while cacao is feminine, so the two balance each other. We liked that balance. The bar smells good, and the first taste is cinnamon. It is a grainy bar, which I hadn’t expected, and tastes quite dark. There’s no percentage listed on the bar. The corn and other spices come out later. It’s an interesting, savory bar. Another chocolate option from Cru is “drinking wheels.” Drinking wheels are big chocolate drops that you dissolve in water for a classic hot chocolate drink. They have 9 varieties of drinking wheels from straight-up hot chocolate to Mayan and Aztec themed flavors to fun flavors like matcha green tea, chai, and peppermint. Eddie said to expect more flavors in the future. They didn’t have samples at the show, so I can’t testify to the taste, but 6 of the flavors won 2018 Academy of Chocolate in London awards. They come 4 wheels to a box — and the boxes are very heavy! That translates to a lot of chocolate per drink. More unusual though were the cacao and mushroom adaptogenic powders, which combine cacao with different types of mushrooms and other herbs, spices, fruits, etc. to have different health benefits. Adaptogens are plants that can help with stress, focus, energy, etc. Cru offers 3 mixes to address different situations, and Eddie told us that you simply add a teaspoon to coffee, tea, water, or smoothies (or take it straight). We tried 2 of the powders: Lion’s Mane for focus, and Queen Reishi for calming. We tried both 2 ways: in warm water, and in mint tea. We tried Lion’s Mane first. The powder has a good smell of chocolate and spice (in addition to the cacao and mushrooms, it also has orange peel, licorice root, and nutmeg). The scent instantly reminded me of Cacoco’s hot chocolate mixes. When we mixed it according to instructions, it is unsurprisingly watery and subtle as opposed to Cacoco drinks, which probably have the ratio reversed. The drink was pleasant with a nice aftertaste. The licorice root gives it a licorice feel, but not a licorice taste. While thin, it maintained a chocolate taste. Of the 3 CBTB-ers who tried it, 2 could see sipping on it (I was the 3rd). However, all of us think it’s best plain; when we tried it in mint tea, it was not a happy marriage. On the Queen Reishi, we all agreed: While the powder has a good smell, it had that bitter metallic/dirt taste of Chinese medicine. It didn’t taste of chocolate, and left a bad taste in our mouths. It was slightly better in mint tea, but it still was unpleasant tasting and had a grainy aftertaste. I don’t think it’s disguisable. Probably like Chinese medicine, if you need it, it doesn’t taste so bad. So I’m gonna say that the 3 of us were chill enough that we didn’t need that particular boost. At the Salon, Cru received Gold for Best Chocolate Bar, Best Organic/Fair Trade Products, and New Product Award; Silver for Best Comfort Food/Snack Product, and Honorable Mention for Top Artisan Chocolatier. Cru Chocolate is available online, at Chocolate Covered and other retailers, and at special events. Check their website for locations. When we stopped by the Basel B Inc. booth, we had to wait because chocolatier Basel Bazlamit was manning the booth solo that morning. Like the sold-out Salon itself, there was a crowd; while waiting, we joked that he was creating the Basel buzz. The wait was worth it to see his new pieces. As always, he had beautiful chocolates: his signature fancy jewels in the Darkness line, plus a Thanksgiving collection of molded chocolates. Hand-painted, molded chocolate boxes in the shape of a pumpkin and a leaf with more chocolates inside reminded me of Charles Chocolates’s edible boxes. He also had a smaller molded pumpkin filled with his new flavor: Fresh pumpkin. The filling was very good with real pumpkin in it adding a slightly fibrous texture. It also had a good cinnamon/spice flavor. My only quibble is that the outer shell was too thick and bitter at 80% for my taste. 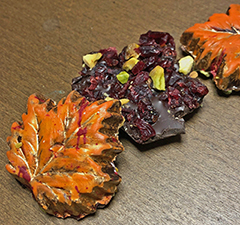 I liked the pretty molded and hand-painted chocolate leaves encrusted with cranberries and pistachios on one side. The toppings were good, and I think they would be delicious on a milk chocolate or less dark chocolate leaf. All of Basel B chocolates are 80%, which I think is usually too bitter for his great fillings and toppings. He told me that he is working on his own milk chocolate blend, and said it would be coming soon. I look forward to it. We didn’t stay long enough to see whether he got his wish or not, but he was still crazy busy when we left. His was one of the buzziest booths at the Salon. Basel B Inc. received Silver for New Product Award and for Bronze Best Caramels/Truffles and Best Organic/Fair Trade Products. 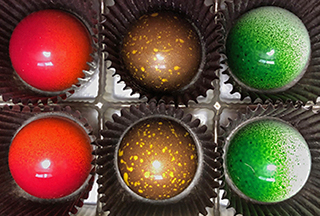 You can buy Basel B Inc. chocolates online and at special events. Check their website. Another super busy chocolatier at the Salon was Elyce Zahn of CocoTutti Chocolates . CocoTutti is a Salon veteran with a loyal following; and as usual, their booth was packed with people sampling and buying. It could be because Elyce always has something unique and lots of samples. 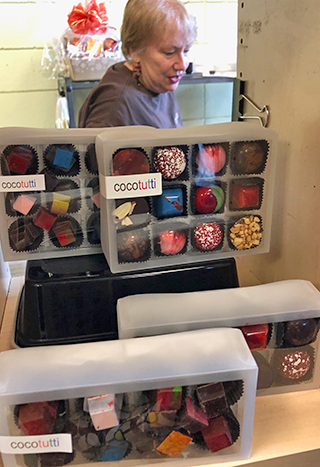 This time there were 7 or 8 different chocolates to try — one reason CocoTutti’s booth was packed — it takes a while to sample all that! One piece stood out for its cool weirdness. The Szechuan Peppercorn Toffee with Cashews is a white chocolate English toffee infused with Szechuan peppercorns with more added on top along with salted cashews. The peppercorns created a really unusual effect — it wasn’t so much a hot taste as a numbness that comes at the end and lasts a long time afterwards, along with the saltiness of the cashews. It felt a little like applying an Icy Hot pain patch to your mouth. It was unexpected and weird in a good way. I also have to mention the white chocolate used (Valrhona) was very good: not too sweet and buttery tasting. If you embrace the weird, you have to try this toffee. Other CocoTutti chocolates that were new at the Salon included a Coffee Toffee Bark with Hazelnuts and an Orange Toffee Bark. The coffee toffee bark was big chunks of espresso flavored toffee and roasted hazelnuts in a 64% dark chocolate. The espresso toffee was yummy on its own, but the added chocolate and big nuts took it over the top. The bark was very crunchy due to the nuts and toffee, with an aftertaste of chocolate and espresso. It ended up being a very chocolaty and nutty piece, and not so about the toffee. The Orange Toffee Bark was a pretty piece with orange-colored white chocolate drizzled over 64% dark chocolate and chunks of caramelized orange toffee. It had a nice mouth feel with the crisp toffee in smooth chocolate, and had a good orange chocolate taste. 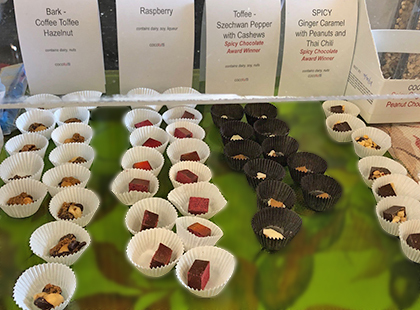 Other samples at the Salon were bonbon/CocoQuintet (CocoTutti’s filled bars) flavors, including CocoTutti classics, like the spicy Ginger Caramel with Peanuts and Thai Chili, which is so hot it makes me cry, but I love the combination anyway. Also the Raspberry with its freeze-dried raspberry dusting on top which makes the raspberry flavor pop. And the Liquid Vanilla Caramel, which is a good classic liquid caramel in good chocolate shell. Rounding out the samples were the Luxardo Cherry and Strawberry-Balsamic, which we swooned over at the last TasteTV Truffle Artistry competition. In the middle of the bustle, Elyce told us what she was up to, first that she’s experimenting on a wasabi crunch flavor, that would be sesame for the crunch, then wasabi at the end. (She would’ve let me sample it too, but since I think wasabi tastes like poison, I declined.) She was also experimenting with smoked paprika and cranberry, and back to developing liquor-centric pieces (like the Whiskey Caramel bonbons and bars, that explode with a great chocolatey, boozy taste in your mouth) and working with 2 distilleries. She told us she’s developing a vanilla toffee with spices and quinoa. Other crunchy ideas she’s working on: peppermint toffee with green peppercorns for crunch (I can’t wait to try that), and whole freeze-dried raspberries blended into chocolate for crunch. That’s a lot, but knowing Elyce, probably not an exaggeration. A CocoTutti tradition at the Salons is that after 2pm, “booboos” are for sale. 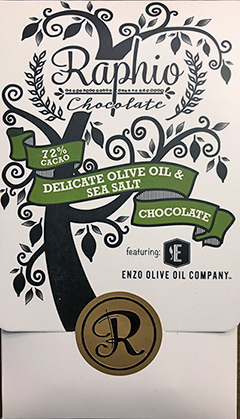 If you want CocoTutti chocolate for yourself and don’t have your heart set on a particular flavor, this is a great option. Any pieces that aren’t up to Elyce’s standards for sale are sold in bulk. At this Salon, that included some of the Luxardo Cherry bonbons, which Elyce told us are a real steal: In addition to being labor intensive including the pretty hand-painted swirls of red and green on top of each bonbon, a can of Luxardo cherries costs $120. Elyce does not skimp. We definitely snagged some of those to enjoy ourselves after the Salon. At the Salon, CocoTutti received Gold for Most Delicious Ingredients Combination, Best Caramels/Truffles, and New Product Award; Silver for Top Artisan Chocolatier, Best Traditional Chocolates, and Best in Salon; and Bronze for Best Toffee and Best Comfort Food/Snack Product. CocoTutti Chocolates are available online, at special events like the Salon, and at select stores. Check their website for locations and events. 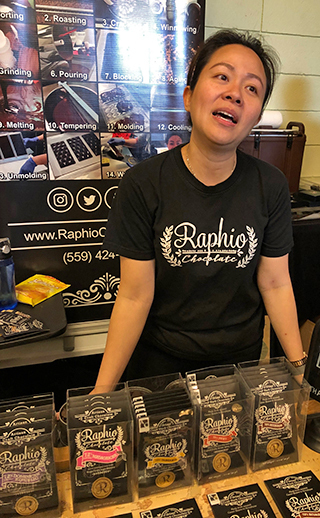 While Fresno’s Raphio Chocolate is a little far to be considered SFBA, I will always make an exception for them and check out what they are doing. They make excellent bean-to-bar chocolate and have expanded into inclusion bars. At the last Salon, they introduced a well-balanced Meyer Lemon Olive Oil bar and a crunchy Coffee bar, which were both excellent; so I was hoping they had more great treats this time around. They did not disappoint with 5(!) new bars: 2 inclusions, 2 single-origin, and one sugar-free bar. I don’t know where the cacao comes from for this bar, but it is very fruity out of the gate with the salt notes coming in later. The olive oil gives it a nice texture, extra smooth and a little slippery. like all Raphio bars, the bar is a good thickness. It melts beautifully, ending with nutty notes. It’s my new favorite olive oil bar. While we didn’t swoon over the other inclusion bar like we did the Delicate Olive Oil & Sea Salt, the Fresno Chili Olive Oil was also great. It started very chocolaty with a slight nutty flavor from the roasted chili olive oil. It got hotter as it melted, and tasted more of a smoky chili flavor. The heat lasted until the end. I didn’t find it too hot, and I liked its smooth, nut-butter texture and long chocolate aftertaste. The 2 new single-origins were distinct from each other and very good bars. The 72% Madegascar first tasted like fresh berries, then citrus. The label describes it as having flavor notes of “Bright Fruity, Light Brownie.” I think bright is an accurate description, and it got brighter as it melted. I thought it was very pleasant, ending with a fermented, wine-like flavor at the end. The other new single-origin bar, the 72% Dominican Republic, was a strong chocolate, a little fruity, ending a little raisiny. It’s slightly bitter. If you like dark chocolate, this is a good one. The last new bar from Raphio at the Salon was a sugar-free blended bar sweetened with monk fruit and erythritol, a sugar alcohol. Yohanes Makmur, Elisia’s husband, told us the sweeteners add zero calories and are a zero glycemic index. They created the bar for people who can’t eat sugar. I approached this one with trepidation because I have never found a sugar-free food that I would eat again. Metallic tasting, too sweet, and/or with an unpleasant aftertaste — life is too short; I avoid them all. But Yohanes encouraged us to try the bar, so we did, and we were surprised. While we expected it to be unpleasant and hard to eat, it started out chocolatey enough for me. As it melted, I started to experience a cooling sensation in my mouth. And there was really nothing of an aftertaste like I expect from eating a quality piece of chocolate. If you can’t eat sugar and want to eat chocolate, I recommend this bar. It tastes better than chocolate sweetened with stevia or artificial sweeteners, in my opinion. It starts out chocolatey but once you feel the cooling sensation, it’s over. Points for no awful aftertaste. If you eat sugar substitutes, you will probably find this bar to be a big improvement on what you are used to. As for me, I will stick with the other Raphio bars with their wonderful flavors, good mouthfeel, and lingering aftertastes. 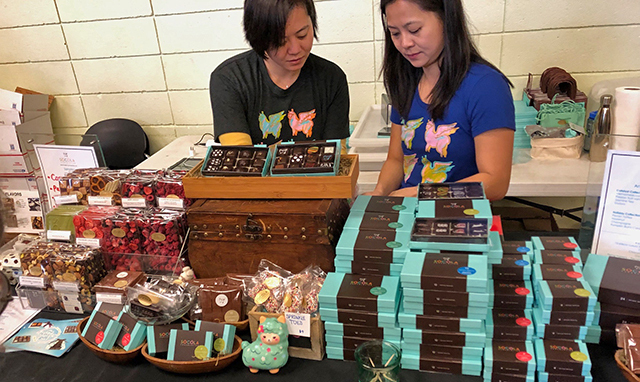 At the Salon, Raphio Chocolate received Gold for Best Chocolate Bar and Best Organic/Fair Trade Products, and Honorable Mention for Top Artisan Chocolatier. Raphio Chocolate has a store at their factory in Fresno, but if that’s too far a trek, Chocolate Covered carries their bars, as do some other local stores (check their website for locations). Or order online. My last stop at the Fall Salon was one of my newer local favs, Michael’s Chocolates, the SF chocolatier who makes the most gorgeous, delicious truffles. And it turns out he makes bars too! After digesting this bit of betrayal, he told me the almond bar story. 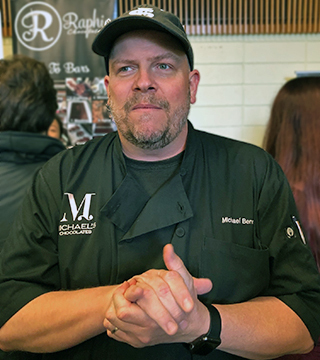 “Michael uses almonds from a local farmer at Ferry Building Farmers Market, which he slow roasts and mixes in a 65% chocolate. Finally, he sprinkles Maldon sea salt on back. As if always-high-quality Michael making a nut bar isn’t enough, it’s a very good value. At the Salon, they were charging $6 for 2.25 oz. bar. The bar is great. The 1st taste is a bit of saltiness from that sprinkling on its backside. It’s a thick bar (1/4”) with chunks of almond throughout. The thickness helps it have a good mouthfeel and good chocolate flavor. The almonds give it a nice chewiness, and the saltiness doesn’t last — the aftertaste is all almond and chocolate. If you like chocolate and almond combos, help keep proving Jack wrong and buy this bar. Michael also had several truffle options at the Salon. The Fall collection included a couple of pieces we had just tried at the Truffle Artistry competition: The pistachio and cardamom (Good Food Awards Finalist 2019), which does the difficult feat of balancing mild pistachio with spicy cardamom; and the coffee toffee, which does its own balancing act between a white-chocolate-caramel-toffee layer on top and a dark-chocolate-coffee ganache layer below. It also included an orange pomegranate truffle, a tangy truffle that was not too orange-y, tempered by the pomegranate. Curtis said that Michael tried to bring out more pomegranate flavor, but it was subtle. They also had single-flavor boxes: the cult-creating Salted Caramels, the Good-Food-Awards-winning Lemon Burst, and the Old Potrero Rye Whiskey: This is the truffle even your non-drinking friends will love. It’s the right blend of a strong whiskey and dark chocolate, so it’s very chocolatey with a slight alcohol buzz. The whiskey just makes it taste more chocolatey. Curtis told us that they were honored this year to be in Dandelion Chocolate’s Advent calendar. 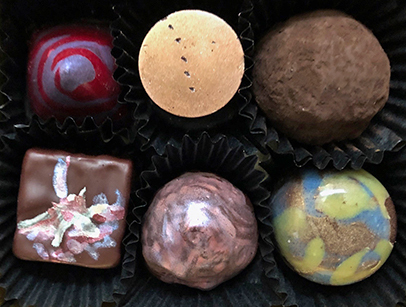 Each year, Dandelion picks 12 SFBA artisan chocolatiers to work with Dandelion’s single origin chocolates to make pieces for the calendar, which also features graphics by local artists. It’s very popular: This year’s calendar was available Nov 16, and sold out before Nov 21. Michael took a break from their busy booth to talk to us. He was excited about a lot of what’s been happening chocolate-wise in his life of late, but he was especially touched meeting his idols through these events, and that they already knew about him. We and his growing legion of fans look forward to it. 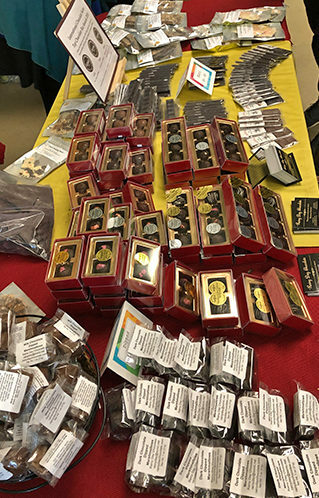 At the Salon, Michael’s Chocolates received Gold for Top Artisan Chocolatier, Most Delicious Ingredients Combination, Best Caramels/Truffles, New Product Award, and Best in Salon; Silver for Best Traditional Chocolates; and Bronze for Best Comfort Food/Snack Product. 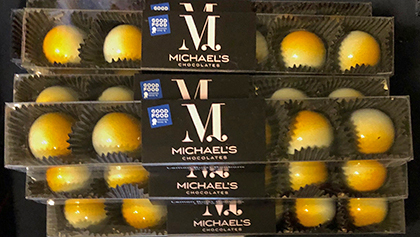 Michael’s Chocolates are available in some local shops in SFBA. Plus they deliver for free in San Francisco. Check their website for locations. And check their events page for chances to meet the maker as well as buy the bonbons. I wasn’t able to meet every local chocolatier at the Salon this time — my other obsession, tap dancing, presented a scheduling conflict: I had a rehearsal to attend. So I missed new chocolatiers Kokak Chocolates and K+M Extravirgin Chocolate (from Napa’s French Laundry restauranteur Thomas Keller), new-to-us brittle maker Brittle California, almost raw chocolate maker Endorfin Foods, and fudge maker Z. Cioccolato. My fellow CBTB chocolateer, cacaopod, stayed to the bitter end — well, at least until 2pm when CocoTutti started selling booboos — and will file a report. Date posted: January 21, 2019. This entry was posted in East Bay chocolate, Featured, Front page, Local chocolate, North Bay, Peninsula chocolate, Recommended chocolatiers, San Francisco chocolate and tagged Basel B Inc., Brittle, Chocolate Salon, CocoTutti, Cru Chocolates, Endorfin Foods, flying noir, Heavenly Taste Toffee, K+M Extravirgin Chocolate, Kindred Cooks, Kokak, Michael's Chocolates, Rainy Day Chocolate, Raphio Chocolate, Socola Chocolatier, Sweet 55, TasteTV, Z. Cioccolato. Bookmark the permalink.